Sir,—How surprised I was to read the glaring error—reference to A.J. Kettle speaking at the inaugural meeting of the Irish Volunteers—in Joseph E.A. 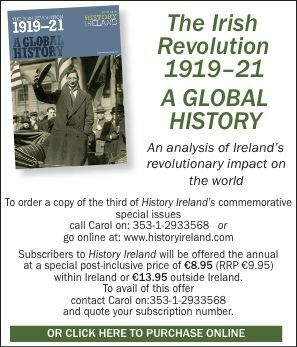 Connell’s ‘Founding of the Irish Volunteers’ (HI 21.6, Nov./Dec. 2013). I imagine that Andrew J. Kettle would have been equally surprised to find himself on the platform at this inaugural meeting. Laurence J. Kettle is the member of the Kettle family who was in fact on the platform. In 1913 Laurence Kettle, son of the aforementioned Andrew J., was deputy city electrical engineer for Dublin, and secretary of the provisional committee of the Irish Volunteers. In this decade of centenary celebrations, the rush to produce articles and books, for the consumption of a perhaps newly interested history audience, finds far too many writers and historians failing to conduct sound scholarly research. As a historian, I find this to be a worrying trend. Since earlier this year—thankfully not in History Ireland—I have seen references to Laurence Kettle as ‘a strike-breaker’, ‘a farmer’, and a man who hired ‘scabs’ to work on his farm. In some accounts of the inaugural meeting, as is the case here, he has been entirely written out of history. It was Laurence Kettle, electrical engineer, upon whom Eoin MacNeill called to recite the manifesto of the Irish Volunteers. It was Laurence Kettle who was shouted down, possibly because of his position with the city of Dublin, or perhaps because of his support of family member, and north County Dublin farmer, Patrick Kettle. During the Lockout, while Patrick Kettle was willing to negotiate any dispute directly with his farm employees, he flatly refused to negotiate with union representatives. Well spotted, but rest assured that this was a typo—an ‘A’ instead of an ‘L’—rather than a failure ‘to conduct sound scholarly research’. Coincidentally, Laurence Kettle’s subsequent role in founding the IIRS is featured in this issue (pp 40–3).